These highlights do not include all the information needed to use LEVETIRACETAM ORAL SOLUTION safely and effectively. See full prescribing information for LEVETIRACETAM ORAL SOLUTION. Use the oral solution for pediatric patients with body weight less than or equal to 20 kg (2.1). To report SUSPECTED ADVERSE REACTIONS contact VistaPharm, Inc. at 1-888-655-1505 or FDA at 1-800-FDA-1088 or www.fda.gov/medwatch. Levetiracetam oral solution is indicated as adjunctive therapy in the treatment of partial onset seizures in adults and children 1 month of age and older with epilepsy. Levetiracetam oral solution is indicated as adjunctive therapy in the treatment of myoclonic seizures in adults and adolescents 12 years of age and older with juvenile myoclonic epilepsy. Levetiracetam oral solution is indicated as adjunctive therapy in the treatment of primary generalized tonic-clonic seizures in adults and children 6 years of age and older with idiopathic generalized epilepsy. Levetiracetam is given orally with or without food. The levetiracetam dosing regimen depends on the indication, age group, dosage form (tablets or oral solution), and renal function. Prescribe the oral solution for pediatric patients with body weight less than or equal to 20 kg. Prescribe the oral solution or tablets for pediatric patients with body weight above 20 kg. For levetiracetam tablet dosing in pediatric patients weighing 20 kg to 40 kg, initiate treatment with a daily dose of 500 mg given as twice daily dosing (250 mg twice daily). Increase the daily dose every 2 weeks by increments of 500 mg to a maximum recommended daily dose of 1,500 mg (750 mg twice daily). For levetiracetam tablet dosing in pediatric patients weighing more than 40 kg, initiate treatment with a daily dose of 1,000 mg/day given as twice daily dosing (500 mg twice daily). Increase the daily dose every 2 weeks by increments of 1,000 mg/day to a maximum recommended daily dose of 3,000 mg (1,500 mg twice daily). Initiate treatment with a daily dose of 20 mg/kg in 2 divided doses (10 mg/kg twice daily). Increase the daily dose every 2 weeks by increments of 20 mg/kg to the recommended daily dose of 60 mg/kg (30 mg/kg twice daily). The effectiveness of doses lower than 60 mg/kg/day has not been adequately studied. Patients with body weight less than or equal to 20 kg should be dosed with oral solution. Patients with body weight above 20 kg can be dosed with either tablets or oral solution [see Dosage and Administration (2.1)]. Levetiracetam oral solution, USP 100 mg/mL is a clear, colorless, grape-flavored liquid. Levetiracetam oral solution is contraindicated in patients with a hypersensitivity to levetiracetam. Reactions have included anaphylaxis and angioedema [see Warnings and Precautions (5.4)]. Levetiracetam may cause behavioral abnormalities and psychotic symptoms. Patients treated with levetiracetam should be monitored for psychiatric signs and symptoms. In clinical studies, 13% of adult levetiracetam-treated patients and 38% of pediatric levetiracetam-treated patients (4 to 16 years of age) compared to 6% and 19% of adult and pediatric placebo-treated patients, experienced non-psychotic behavioral symptoms (reported as aggression, agitation, anger, anxiety, apathy, depersonalization, depression, emotional lability, hostility, hyperkinesias, irritability, nervousness, neurosis, and personality disorder). A randomized double-blind, placebo-controlled study was performed to assess the neurocognitive and behavioral effects of levetiracetam as adjunctive therapy in pediatric patients (4 to 16 years of age). The results from an exploratory analysis indicated a worsening in levetiracetam-treated patients on aggressive behavior (one of eight behavior dimensions) as measured in a standardized and systematic way using a validated instrument, the Achenbach Child Behavior Checklist (CBCL/6-18). In clinical studies in pediatric patients 1 month to less than 4 years of age, irritability was reported in 12% of the levetiracetam-treated patients compared to 0% of placebo-treated patients. In clinical studies, 1.7% of adult levetiracetam-treated patients discontinued treatment due to behavioral adverse reactions, compared to 0.2% of placebo-treated patients. The treatment dose was reduced in 0.8% of adult levetiracetam-treated patients and in 0.5% of placebo-treated patients. Overall, 11% of levetiracetam-treated pediatric patients experienced behavioral symptoms associated with discontinuation or dose reduction, compared to 6% of placebo-treated patients. In clinical studies, 1% of levetiracetam-treated adult patients, 2% of levetiracetam-treated pediatric patients 4 to 16 years of age, and 17% of levetiracetam-treated pediatric patients 1 month to less than 4 years of age experienced psychotic symptoms, compared to 0.2%, 2%, and 5% in the corresponding age groups treated with placebo. In a controlled study that assessed the neurocognitive and behavioral effects of levetiracetam in pediatric patients 4 to 16 years of age, 1.6% of levetiracetam-treated patients experienced paranoia, compared to 0% of placebo-treated patients. 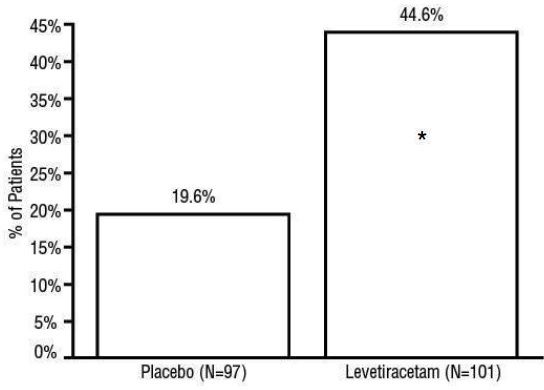 In the same study, 3.1% of levetiracetam-treated patients experienced confusional state, compared to 0% of placebo-treated patients [see Use in Specific Populations (8.4)]. In clinical studies, two (0.3%) levetiracetam-treated adult patients were hospitalized and their treatment was discontinued due to psychosis. Both events, reported as psychosis, developed within the first week of treatment and resolved within 1 to 2 weeks following treatment discontinuation. There was no difference between drug and placebo-treated patients in the incidence of the pediatric patients who discontinued treatment due to psychotic and non-psychotic adverse reactions. Antiepileptic drugs (AEDs), including levetiracetam, increase the risk of suicidal thoughts or behavior in patients taking these drugs for any indication. Patients treated with any AED for any indication should be monitored for the emergence or worsening of depression, suicidal thoughts or behavior, and/or any unusual changes in mood or behavior. Pooled analyses of 199 placebo-controlled clinical trials (mono- and adjunctive therapy) of 11 different AEDs showed that patients randomized to one of the AEDs had approximately twice the risk (adjusted Relative Risk 1.8, 95% CI:1.2, 2.7) of suicidal thinking or behavior compared to patients randomized to placebo. In these trials, which had a median treatment duration of 12 weeks, the estimated incidence rate of suicidal behavior or ideation among 27,863 AED treated patients was 0.43%, compared to 0.24% among 16,029 placebo-treated patients, representing an increase of approximately one case of suicidal thinking or behavior for every 530 patients treated. There were four suicides in drug-treated patients in the trials and none in placebo-treated patients, but the number is too small to allow any conclusion about drug effect on suicide. Anyone considering prescribing levetiracetam or any other AED must balance the risk of suicidal thoughts or behaviors with the risk of untreated illness. Epilepsy and many other illnesses for which AEDs are prescribed are themselves associated with morbidity and mortality and an increased risk of suicidal thoughts and behavior. Should suicidal thoughts and behavior emerge during treatment, the prescriber needs to consider whether the emergence of these symptoms in any given patient may be related to the illness being treated. Levetiracetam may cause somnolence and fatigue. Patients should be monitored for these signs and symptoms and advised not to drive or operate machinery until they have gained sufficient experience on levetiracetam to gauge whether it adversely affects their ability to drive or operate machinery. In controlled trials of adult patients with epilepsy experiencing partial onset seizures, 15% of levetiracetam-treated patients reported somnolence, compared to 8% of placebo-treated patients. There was no clear dose response up to 3,000 mg/day. In a study where there was no titration, about 45% of patients receiving 4,000 mg/day reported somnolence. The somnolence was considered serious in 0.3% of levetiracetam-treated patients, compared to 0% in the placebo group. About 3% of levetiracetam-treated patients discontinued treatment due to somnolence, compared to 0.7% of placebo-treated patients. In 1.4% of levetiracetam-treated patients and 0.9% of placebo-treated patients, the dose was reduced, while 0.3% of the levetiracetam-treated patients were hospitalized due to somnolence. In controlled clinical studies of adult patients with epilepsy experiencing partial onset seizures, 15% of levetiracetam-treated patients reported asthenia, compared to 9% of placebo-treated patients. Treatment was discontinued due to asthenia in 0.8% of levetiracetam-treated patients as compared to 0.5% of placebo-treated patients. In 0.5% of levetiracetam-treated patients and in 0.2% of placebo-treated patients, the dose was reduced due to asthenia. Levetiracetam can cause anaphylaxis or angioedema after the first dose or at any time during treatment. Signs and symptoms in cases reported in the postmarketing setting have included hypotension, hives, rash, respiratory distress, and swelling of the face, lip, mouth, eye, tongue, throat, and feet. In some reported cases, reactions were life-threatening and required emergency treatment. If a patient develops signs or symptoms of anaphylaxis or angioedema, levetiracetam should be discontinued and the patient should seek immediate medical attention. Levetiracetam should be discontinued permanently if a clear alternative etiology for the reaction cannot be established [see Contraindications (4)]. Serious dermatological reactions, including Stevens-Johnson syndrome (SJS) and toxic epidermal necrolysis (TEN), have been reported in both pediatric and adult patients treated with levetiracetam. The median time of onset is reported to be 14 to 17 days, but cases have been reported at least four months after initiation of treatment. Recurrence of the serious skin reactions following rechallenge with levetiracetam has also been reported. Levetiracetam should be discontinued at the first sign of a rash, unless the rash is clearly not drug-related. If signs or symptoms suggest SJS/TEN, use of this drug should not be resumed and alternative therapy should be considered. Levetiracetam may cause coordination difficulties. In controlled clinical studies in adult patients with partial onset seizure studies, 3.4% of adult levetiracetam-treated patients experienced coordination difficulties, (reported as either ataxia, abnormal gait, or incoordination) compared to 1.6% of placebo-treated patients. A total of 0.4% of patients in controlled clinical studies discontinued levetiracetam treatment due to ataxia, compared to 0% of placebo-treated patients. In 0.7% of levetiracetam-treated patients and in 0.2% of placebo-treated patients, the dose was reduced due to coordination difficulties, while one of the levetiracetam-treated patients was hospitalized due to worsening of pre-existing ataxia. These events occurred most frequently within the first 4 weeks of treatment. Patients should be monitored for these signs and symptoms and advised not to drive or operate machinery until they have gained sufficient experience on levetiracetam to gauge whether it could adversely affect their ability to drive or operate machinery. Levetiracetam can cause hematologic abnormalities. Hematologic abnormalities occurred in clinical trials and included decreases in white blood cell (WBC), neutrophil, and red blood cell (RBC) counts; decreases in hemoglobin and hematocrit; and increases in eosinophil counts. Cases of agranulocytosis, pancytopenia, and thrombocytopenia have been reported in the postmarketing setting. A complete blood count is recommended in patients experiencing significant weakness, pyrexia, recurrent infections, or coagulation disorders. Minor, but statistically significant, decreases compared to placebo in total mean RBC count (0.03 x 106/mm3), mean hemoglobin (0.09 g/dL), and mean hematocrit (0.38%), were seen in levetiracetam-treated patients in controlled trials. 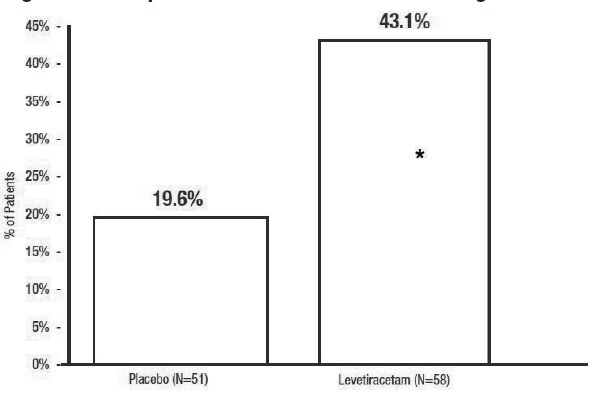 A total of 3.2% of levetiracetam-treated and 1.8% of placebo-treated patients had at least one possibly significant (less than or equal to 2.8 x 109/L) decreased WBC, and 2.4% of levetiracetam-treated and 1.4% of placebo-treated patients had at least one possibly significant (less than or equal to 1.0 x 109/L) decreased neutrophil count. Of the levetiracetam-treated patients with a low neutrophil count, all but one rose towards or to baseline with continued treatment. No patient was discontinued secondary to low neutrophil counts. Statistically significant decreases in WBC and neutrophil counts were seen in levetiracetam-treated patients as compared to placebo. 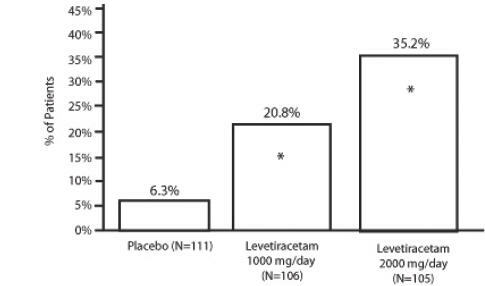 The mean decreases from baseline in the levetiracetam-treated group were -0.4 × 109/L and -0.3 × 109/L, respectively, whereas there were small increases in the placebo group. Mean relative lymphocyte counts increased by 1.7% in levetiracetam-treated patients, compared to a decrease of 4% in placebo patients (statistically significant). In the controlled trial, more levetiracetam-treated patients had a possibly clinically significant abnormally low WBC value (3% of levetiracetam-treated patients versus 0% of placebo-treated patients), however, there was no apparent difference between treatment groups with respect to neutrophil count (5% of levetiracetam-treated patients versus 4.2% of placebo-treated patients). No patient was discontinued secondary to low WBC or neutrophil counts. In the controlled cognitive and neuropsychological safety study, 5 patients (8.6%) in the levetiracetam-treated group and two patients (6.1%) in the placebo-treated group had high eosinophil count values that were possibly clinically significant (greater than or equal to 10% or greater than or equal to 0.7 X 109/L). In a randomized, placebo-controlled study in patients 1 month to less than 4 years of age, a significantly higher risk of increased diastolic blood pressure was observed in the levetiracetam-treated patients (17%), compared to the placebo-treated patients (2%). There was no overall difference in mean diastolic blood pressure between the treatment groups. This disparity between the levetiracetam and placebo treatment groups was not observed in the studies of older children or in adults. Monitor patients 1 month to less than 4 years of age for increases in diastolic blood pressure. In controlled clinical studies in adults with partial onset seizures, the most common adverse reactions in patients receiving levetiracetam in combination with other AEDs, for events with rates greater than placebo, were somnolence, asthenia, infection, and dizziness. Of the most common adverse reactions in adults experiencing partial onset seizures, asthenia, somnolence, and dizziness occurred predominantly during the first 4 weeks of treatment with levetiracetam. Table 3 lists adverse reactions that occurred in at least 1% of adult epilepsy patients receiving levetiracetam in placebo-controlled studies and were numerically more common than in patients treated with placebo. In these studies, either levetiracetam or placebo was added to concurrent AED therapy. In controlled adult clinical studies, 15% of patients receiving levetiracetam and 12% receiving placebo either discontinued or had a dose reduction as a result of an adverse reaction. Table 4 lists the most common (greater than 1%) adverse reactions that resulted in discontinuation or dose reduction and that occurred more frequently in levetiracetam-treated patients than in placebo-treated patients. The adverse reaction data presented below was obtained from a pooled analysis of two controlled pediatric clinical studies in pediatric patients 4 to 16 years of age with partial onset seizures. The most common adverse reactions in pediatric patients receiving levetiracetam in combination with other AEDs, for events with rates greater than placebo, were fatigue, aggression, nasal congestion, decreased appetite, and irritability. Table 5 lists adverse reactions from the pooled pediatric controlled studies (4 to 16 years of age) that occurred in at least 2% of pediatric levetiracetam-treated patients and were numerically more common than in pediatric patients treated with placebo. In these studies, either levetiracetam or placebo was added to concurrent AED therapy. In the controlled pooled pediatric clinical studies in patients 4 to 16 years of age, 7% of patients receiving Levetiracetam and 9% receiving placebo discontinued as a result of an adverse reaction. In the 7-day, controlled pediatric clinical study in children 1 month to less than 4 years of age with partial onset seizures, the most common adverse reactions in patients receiving levetiracetam in combination with other AEDs, for events with rates greater than placebo, were somnolence and irritability. Because of the shorter exposure period, incidences of adverse reactions are expected to be lower than in other pediatric studies in older patients. Therefore, other controlled pediatric data, presented above, should also be considered to apply to this age group. Table 6 lists adverse reactions that occurred in at least 5% of pediatric epilepsy patients (ages 1 month to less than 4 years) treated with levetiracetam in the placebo-controlled study and were numerically more common than in patients treated with placebo. In this study, either levetiracetam or placebo was added to concurrent AED therapy. In the 7-day controlled pediatric clinical study in patients 1 month to less than 4 years of age, 3% of patients receiving levetiracetam and 2% receiving placebo either discontinued or had a dose reduction as a result of an adverse reaction. There was no adverse reaction that resulted in discontinuation for more than one patient. In the controlled clinical study in patients 12 years of age and older with myoclonic seizures, the most common adverse reactions in patients receiving levetiracetam in combination with other AEDs, for events with rates greater than placebo, were somnolence, neck pain, and pharyngitis. Table 7 lists adverse reactions that occurred in at least 5% of juvenile myoclonic epilepsy patients experiencing myoclonic seizures treated with levetiracetam and were numerically more common than in patients treated with placebo. In this study, either levetiracetam or placebo was added to concurrent AED therapy. In the placebo-controlled study, 8% of patients receiving levetiracetam and 2% receiving placebo either discontinued or had a dose reduction as a result of an adverse reaction. The adverse reactions that led to discontinuation or dose reduction and that occurred more frequently in levetiracetam-treated patients than in placebo-treated patients are presented in Table 8. In the controlled clinical study that included patients 4 years of age and older with PGTC seizures, the most common adverse reaction in patients receiving levetiracetam in combination with other AEDs, for events with rates greater than placebo, was nasopharyngitis. Table 9 lists adverse reactions that occurred in at least 5% of idiopathic generalized epilepsy patients experiencing PGTC seizures treated with levetiracetam and were numerically more common than in patients treated with placebo. In this study, either levetiracetam or placebo was added to concurrent AED therapy. This study was too small to adequately characterize the adverse reactions that could be expected to result in discontinuation of treatment in this population. It is expected that the adverse reactions that would lead to discontinuation in this population would be similar to those resulting in discontinuation in other epilepsy trials (see tables 4 and 8). The following adverse reactions have been identified during postapproval use of levetiracetam. Because these reactions are reported voluntarily from a population of uncertain size, it is not always possible to reliably estimate their frequency or establish a causal relationship to drug exposure. The following adverse reactions have been reported in patients receiving marketed levetiracetam worldwide. The listing is alphabetized: abnormal liver function test, acute kidney injury, anaphylaxis, angioedema, agranulocytosis, choreoathetosis, drug reaction with eosinophilia and systemic symptoms (DRESS), dyskinesia, erythema multiforme, hepatic failure, hepatitis, hyponatremia, muscular weakness, pancreatitis, pancytopenia (with bone marrow suppression identified in some of these cases), panic attack, thrombocytopenia, and weight loss. Alopecia has been reported with levetiracetam use; recovery was observed in majority of cases where levetiracetam was discontinued. Levetiracetam blood levels may decrease during pregnancy [see Warnings and Precautions (5.10)]. There are no adequate and controlled studies in pregnant women. In animal studies, levetiracetam produced evidence of developmental toxicity, including teratogenic effects, at doses similar to or greater than human therapeutic doses. Levetiracetam should be used during pregnancy only if the potential benefit justifies the potential risk to the fetus. Oral administration of levetiracetam to female rats throughout pregnancy and lactation led to increased incidences of minor fetal skeletal abnormalities and retarded offspring growth pre- and/or postnatally at doses greater than or equal to 350 mg/kg/day (equivalent to the maximum recommended human dose of 3,000 mg [MRHD] on a mg/m2 basis) and with increased pup mortality and offspring behavioral alterations at a dose of 1,800 mg/kg/day (6 times the MRHD on a mg/m2 basis). The developmental no effect dose was 70 mg/kg/day (0.2 times the MRHD on a mg/m2 basis). There was no overt maternal toxicity at the doses used in this study. Oral administration of levetiracetam to pregnant rabbits during the period of organogenesis resulted in increased embryofetal mortality and increased incidences of minor fetal skeletal abnormalities at doses greater than or equal to 600 mg/kg/day (4 times MRHD on a mg/m2 basis) and in decreased fetal weights and increased incidences of fetal malformations at a dose of 1,800 mg/kg/day (12 times the MRHD on a mg/m2 basis). The developmental no effect dose was 200 mg/kg/day (equivalent to the MRHD on a mg/m2 basis). Maternal toxicity was also observed at 1,800 mg/kg/day. Treatment of rats with levetiracetam during the last third of gestation and throughout lactation produced no adverse developmental or maternal effects at doses of up to 1,800 mg/kg/day (6 times the MRHD on a mg/m2 basis). To provide information regarding the effects of in utero exposure to levetiracetam, physicians are advised to recommend that pregnant patients taking levetiracetam enroll in the North American Antiepileptic Drug (NAAED) pregnancy registry. This can be done by calling the toll free number 1-888-233-2334, and must be done by the patients themselves. Information on the registry can also be found at the website http://www.aedpregnancyregistry.org/. The safety and effectiveness of levetiracetam in the adjunctive treatment of partial onset seizures in pediatric patients age 1 month to 16 years old with epilepsy have been established [see Clinical Studies (14.1)]. The dosing recommendation in these pediatric patients varies according to age group and is weight-based [see Dosage and Administration (2.2)]. The safety and effectiveness of levetiracetam as adjunctive treatment of myoclonic seizures in adolescents 12 years of age and older with juvenile myoclonic epilepsy have been established [see Clinical Studies (14.2)]. The safety and effectiveness of levetiracetam as adjunctive therapy in the treatment of primary generalized tonic-clonic seizures in pediatric patients 6 years of age and older with idiopathic generalized epilepsy have been established [see Clinical Studies (14.3)]. A 3-month, randomized, double-blind, placebo-controlled study was performed to assess the neurocognitive and behavioral effects of levetiracetam as adjunctive therapy in 98 (levetiracetam N=64, placebo N=34) pediatric patients, ages 4 to 16 years old, with partial seizures that were inadequately controlled. The target dose was 60 mg/kg/day. Neurocognitive effects were measured by the Letter-R Attention and Memory (AM) Battery, which measures various aspects of a child’s memory and attention. Although no substantive differences were observed between the placebo and drug treated groups in the median change from baseline in this battery, the study was not adequate to assess formal statistical non-inferiority of the drug and placebo. The Achenbach Child Behavior Checklist (CBCL/6 to 18), a standardized validated tool used to assess a child’s competencies and behavioral/emotional problems, was also assessed in this study. An analysis of the CBCL/6 to 18 indicated on average a worsening in levetiracetam-treated patients in aggressive behavior, one of the eight syndrome scores [see Warnings and Precautions (5.1)]. Studies of levetiracetam in juvenile rats (dosing from day 4 through day 52 of age) and dogs (dosing from week 3 through week 7 of age) at doses of up to 1,800 mg/kg/day (approximately 7 and 24 times, respectively, the maximum recommended pediatric dose of 60 mg/kg/day on a mg/m2 basis) did not indicate a potential for age-specific toxicity. There were 347 subjects in clinical studies of levetiracetam that were 65 and over. No overall differences in safety were observed between these subjects and younger subjects. There were insufficient numbers of elderly subjects in controlled trials of epilepsy to adequately assess the effectiveness of levetiracetam in these patients. Clearance of levetiracetam is decreased in patients with renal impairment and is correlated with creatinine clearance [see Clinical Pharmacology (12.3)]. Dose adjustment is recommended for patients with impaired renal function and supplemental doses should be given to patients after dialysis [see Dosage and Administration (2.5)]. The highest known dose of levetiracetam received in the clinical development program was 6,000 mg/day. Other than drowsiness, there were no adverse reactions in the few known cases of overdose in clinical trials. Cases of somnolence, agitation, aggression, depressed level of consciousness, respiratory depression and coma were observed with levetiracetam overdoses in postmarketing use. There is no specific antidote for overdose with levetiracetam. If indicated, elimination of unabsorbed drug should be attempted by emesis or gastric lavage; usual precautions should be observed to maintain airway. General supportive care of the patient is indicated including monitoring of vital signs and observation of the patient’s clinical status. A Certified Poison Control Center should be contacted for up to date information on the management of overdose with levetiracetam. Standard hemodialysis procedures result in significant clearance of levetiracetam (approximately 50% in 4 hours) and should be considered in cases of overdose. Although hemodialysis has not been performed in the few known cases of overdose, it may be indicated by the patient’s clinical state or in patients with significant renal impairment. Levetiracetam, USP is an antiepileptic drug available as colorless, grape-flavored liquid (100 mg/mL) for oral administration. Levetiracetam oral solution, USP contains 100 mg of levetiracetam per mL. Inactive ingredients: ammonium glycyrrhizate, citric acid monohydrate, glycerin, maltitol solution, methylparaben, potassium acesulfame, propylparaben, purified water, sodium citrate dihydrate and natural and artificial flavor. A saturable and stereoselective neuronal binding site in rat brain tissue has been described for levetiracetam. Experimental data indicate that this binding site is the synaptic vesicle protein SV2A, thought to be involved in the regulation of vesicle exocytosis. Although the molecular significance of levetiracetam binding to SV2A is not understood, levetiracetam and related analogs showed a rank order of affinity for SV2A which correlated with the potency of their antiseizure activity in audiogenic seizure-prone mice. These findings suggest that the interaction of levetiracetam with the SV2A protein may contribute to the antiepileptic mechanism of action of the drug. 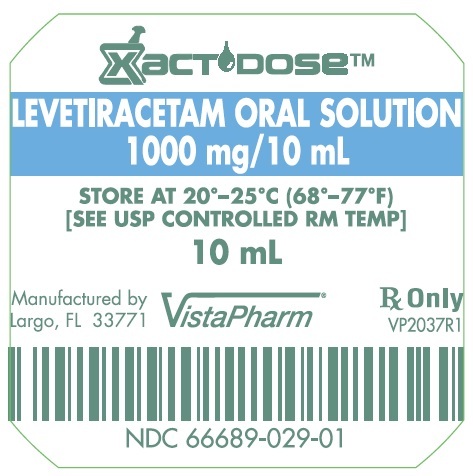 Absorption of levetiracetam is rapid, with peak plasma concentrations occurring in about an hour following oral administration in fasted subjects. The oral bioavailability of levetiracetam tablets is 100% and the tablets and oral solution are bioequivalent in rate and extent of absorption. Food does not affect the extent of absorption of levetiracetam but it decreases Cmax by 20% and delays Tmax by 1.5 hours. The pharmacokinetics of levetiracetam are linear over the dose range of 500 mg to 5,000 mg. Steady state is achieved after 2 days of multiple twice-daily dosing. Levetiracetam and its major metabolite are less than 10% bound to plasma proteins; clinically significant interactions with other drugs through competition for protein binding sites are therefore unlikely. Levetiracetam plasma half-life in adults is 7 ± 1 hour and is unaffected by either dose or repeated administration. Levetiracetam is eliminated from the systemic circulation by renal excretion as unchanged drug which represents 66% of administered dose. The total body clearance is 0.96 mL/min/kg and the renal clearance is 0.6 mL/min/kg. The mechanism of excretion is glomerular filtration with subsequent partial tubular reabsorption. The metabolite ucb L057 is excreted by glomerular filtration and active tubular secretion with a renal clearance of 4 mL/min/kg. Levetiracetam elimination is correlated to creatinine clearance. Levetiracetam clearance is reduced in patients with renal impairment [see Use in Specific Populations (8.6)and Dosage and Administration (2.5)]. Pharmacokinetics of levetiracetam were evaluated in 24 pediatric patients (age 6 to 12 years) after single dose (20 mg/kg). The body weight adjusted apparent clearance of levetiracetam was approximately 40% higher than in adults. Following single dose administration (20 mg/kg) of a 10% oral solution to children with epilepsy (1 month to less than 4 years), levetiracetam was rapidly absorbed and peak plasma concentrations were observed approximately 1 hour after dosing. The pharmacokinetic results indicated that half-life was shorter (5.3 h) than for adults (7.2 h) and apparent clearance was faster (1.5 mL/min/kg) than for adults (0.96 mL/min/kg). Population pharmacokinetic analysis showed that body weight was significantly correlated to the clearance of levetiracetam in pediatric patients; clearance increased with an increase in body weight. Formal pharmacokinetic studies of the effects of race have not been conducted. Cross-study comparisons involving Caucasians (N=12) and Asians (N=12), however, show that pharmacokinetics of levetiracetam were comparable between the two races. Because levetiracetam is primarily renally excreted and there are no important racial differences in creatinine clearance, pharmacokinetic differences due to race are not expected. The disposition of levetiracetam was studied in adult subjects with varying degrees of renal function. 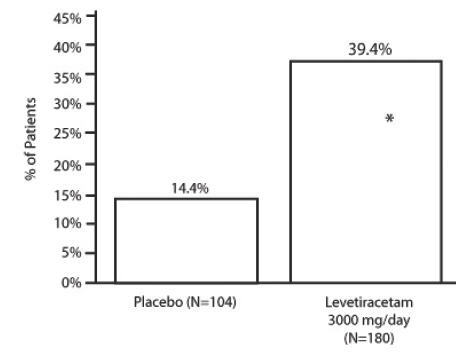 Total body clearance of levetiracetam is reduced in patients with impaired renal function by 40% in the mild group (CLcr = 50 to 80 mL/min), 50% in the moderate group (CLcr = 30 to 50 mL/min) and 60% in the severe renal impairment group (CLcr < 30 mL/min). Clearance of levetiracetam is correlated with creatinine clearance. In anuric (end stage renal disease) patients, the total body clearance decreased 70% compared to normal subjects (CLcr > 80 mL/min). Approximately 50% of the pool of levetiracetam in the body is removed during a standard 4-hour hemodialysis procedure [see Dosage and Administration (2.5)]. In vitro data on metabolic interactions indicate that levetiracetam is unlikely to produce, or be subject to, pharmacokinetic interactions. Levetiracetam and its major metabolite, at concentrations well above Cmax levels achieved within the therapeutic dose range, are neither inhibitors of, nor high affinity substrates for, human liver cytochrome P450 isoforms, epoxide hydrolase or UDP-glucuronidation enzymes. In addition, levetiracetam does not affect the in vitro glucuronidation of valproic acid. There was about a 22% increase of apparent total body clearance of levetiracetam when it was coadministered with enzyme-inducing AEDs. Dose adjustment is not recommended. Levetiracetam had no effect on plasma concentrations of carbamazepine, valproate, topiramate, or lamotrigine. 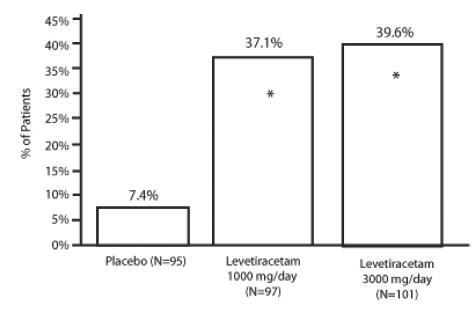 Study 1 was a double-blind, placebo-controlled, parallel-group study conducted at 41 sites in the United States comparing levetiracetam 1,000 mg/day (N=97), levetiracetam 3,000 mg/day (N=101), and placebo (N=95) given in equally divided doses twice daily. After a prospective baseline period of 12 weeks, patients were randomized to one of the three treatment groups described above. The 18-week treatment period consisted of a 6-week titration period, followed by a 12-week fixed dose evaluation period, during which concomitant AED regimens were held constant. The primary measure of effectiveness was a between group comparison of the percent reduction in weekly partial seizure frequency relative to placebo over the entire randomized treatment period (titration + evaluation period). Secondary outcome variables included the responder rate (incidence of patients with greater than or equal to 50% reduction from baseline in partial onset seizure frequency). The results of the analysis of Study 1 are displayed in Table 10. The percentage of patients (y-axis) who achieved greater than or equal to 50% reduction in weekly seizure rates from baseline in partial onset seizure frequency over the entire randomized treatment period (titration + evaluation period) within the three treatment groups (x-axis) is presented in Figure 1. The first period of the study (Period A) was designed to be analyzed as a parallel-group study. After a prospective baseline period of up to 12 weeks, patients were randomized to one of the three treatment groups described above. The 16-week treatment period consisted of the 4-week titration period followed by a 12-week fixed dose evaluation period, during which concomitant AED regimens were held constant. The primary measure of effectiveness was a between group comparison of the percent reduction in weekly partial seizure frequency relative to placebo over the entire randomized treatment period (titration + evaluation period). Secondary outcome variables included the responder rate (incidence of patients with greater than or equal to 50% reduction from baseline in partial onset seizure frequency). The results of the analysis of Period A are displayed in Table 11. The percentage of patients (y-axis) who achieved greater than or equal to 50% reduction in weekly seizure rates from baseline in partial onset seizure frequency over the entire randomized treatment period (titration + evaluation period) within the three treatment groups (x-axis) is presented in Figure 2. Study 3 was a double-blind, placebo-controlled, parallel-group study conducted at 47 centers in Europe comparing levetiracetam 3,000 mg/day (N=180) and placebo (N=104) in patients with refractory partial onset seizures, with or without secondary generalization, receiving only one concomitant AED. Study drug was given in two divided doses. After a prospective baseline period of 12 weeks, patients were randomized to one of two treatment groups described above. The 16-week treatment period consisted of a 4-week titration period, followed by a 12-week fixed dose evaluation period, during which concomitant AED doses were held constant. The primary measure of effectiveness was a between group comparison of the percent reduction in weekly seizure frequency relative to placebo over the entire randomized treatment period (titration + evaluation period). Secondary outcome variables included the responder rate (incidence of patients with greater than or equal to 50% reduction from baseline in partial onset seizure frequency). Table 12 displays the results of the analysis of Study 3. The percentage of patients (y-axis) who achieved greater than or equal to 50% reduction in weekly seizure rates from baseline in partial onset seizure frequency over the entire randomized treatment period (titration + evaluation period) within the two treatment groups (x-axis) is presented in Figure 3. The effectiveness of levetiracetam as adjunctive therapy (added to other antiepileptic drugs) in pediatric patients was established in one multicenter, randomized double-blind, placebo-controlled study (Study 4), conducted at 60 sites in North America, in pediatric patients 4 to 16 years of age with partial seizures uncontrolled by standard antiepileptic drugs (AEDs). Eligible patients on a stable dose of 1 to 2 AEDs, who still experienced at least 4 partial onset seizures during the 4 weeks prior to screening, as well as at least 4 partial onset seizures in each of the two 4-week baseline periods, were randomized to receive either levetiracetam or placebo. The enrolled population included 198 patients (levetiracetam N=101, placebo N=97) with refractory partial onset seizures, whether or not secondarily generalized. The study consisted of an 8-week baseline period and 4-week titration period followed by a 10-week evaluation period. Dosing was initiated at a dose of 20 mg/kg/day in two divided doses. During the treatment period, levetiracetam doses were adjusted in 20 mg/kg/day increments, at 2-week intervals to the target dose of 60 mg/kg/day. The primary measure of effectiveness was a between group comparison of the percent reduction in weekly partial seizure frequency relative to placebo over the entire 14-week randomized treatment period (titration + evaluation period). Secondary outcome variables included the responder rate (incidence of patients with greater than or equal to 50% reduction from baseline in partial onset seizure frequency per week). Table 13 displays the results of this study. The percentage of patients (y-axis) who achieved greater than or equal to 50% reduction in weekly seizure rates from baseline in partial onset seizure frequency over the entire randomized treatment period (titration + evaluation period) within the two treatment groups (x-axis) is presented in Figure 4. The effectiveness of levetiracetam as adjunctive therapy in pediatric patients was established in one multicenter, randomized double-blind, placebo-controlled study (Study 5), conducted at 62 sites in North America, South America, and Europe in pediatric patients 1 month to less than 4 years of age with partial seizures, uncontrolled by standard epileptic drugs (AEDs). Eligible patients on a stable dose of 1-2 AEDs, who experienced at least 2 partial onset seizures during the 48-hour baseline video EEG were randomized to receive either levetiracetam or placebo. The enrolled population included 116 patients (levetiracetam N=60, placebo N=56) with refractory partial onset seizures, whether or not secondarily generalized. Randomization was stratified by age range as follows: 1 month to less than 6 months of age (N=4 treated with levetiracetam), 6 months to less than 1 year of age (N=8 treated with levetiracetam), 1 year to less than 2 years of age (N=20 treated with levetiracetam), and 2 years to less than 4 years of age (N=28 treated with levetiracetam). The study consisted of a 5-day evaluation period which included a 1-day titration period followed by a 4-day maintenance period. Levetiracetam dosing was determined by age and weight as follows: children 1 month to less than 6 months old were randomized to a target dose of 40 mg/kg/day, and children 6 months to less than 4 years old were randomized to a target dose of 50 mg/kg/day. The primary measure of effectiveness was the responder rate (percent of patients with greater than or equal to 50% reduction from baseline in average daily partial onset seizure frequency) assessed by a blinded central reader using a 48-hour video EEG performed during the last two days of the 4-day maintenance period. A total of 109 patients were included in the efficacy analysis. 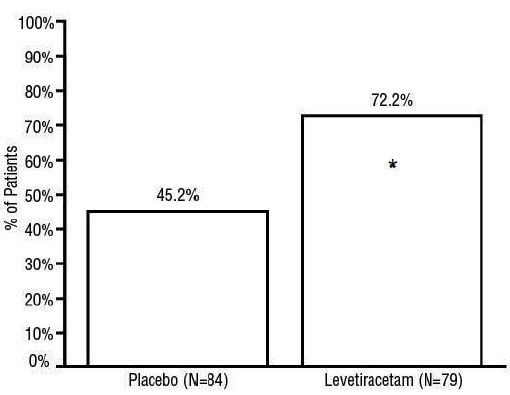 A statistically significant difference between levetiracetam and placebo was observed (see Figure 5). The treatment effect associated with levetiracetam was consistent across age groups. The effectiveness of levetiracetam as adjunctive therapy (added to other antiepileptic drugs) in patients 12 years of age and older with juvenile myoclonic epilepsy (JME) experiencing myoclonic seizures was established in one multicenter, randomized, double-blind, placebo-controlled study (Study 6), conducted at 37 sites in 14 countries. Of the 120 patients enrolled, 113 had a diagnosis of confirmed or suspected JME. Eligible patients on a stable dose of 1 antiepileptic drug (AED) experiencing one or more myoclonic seizures per day for at least 8 days during the prospective 8-week baseline period were randomized to either levetiracetam or placebo (levetiracetam N=60, placebo N=60). Patients were titrated over 4 weeks to a target dose of 3,000 mg/day and treated at a stable dose of 3,000 mg/day over 12 weeks (evaluation period). Study drug was given in 2 divided doses. The primary measure of effectiveness was the proportion of patients with at least 50% reduction in the number of days per week with one or more myoclonic seizures during the treatment period (titration + evaluation periods) as compared to baseline. Table 14 displays the results for the 113 patients with JME in this study. The effectiveness of levetiracetam as adjunctive therapy (added to other antiepileptic drugs) in patients 6 years of age and older with idiopathic generalized epilepsy experiencing primary generalized tonic-clonic (PGTC) seizures was established in one multicenter, randomized, double-blind, placebo-controlled study (Study 7), conducted at 50 sites in 8 countries. Eligible patients on a stable dose of 1 or 2 antiepileptic drugs (AEDs) experiencing at least 3 PGTC seizures during the 8-week combined baseline period (at least one PGTC seizure during the 4 weeks prior to the prospective baseline period and at least one PGTC seizure during the 4-week prospective baseline period) were randomized to either levetiracetam or placebo. The 8-week combined baseline period is referred to as “baseline” in the remainder of this section. Patients were titrated over 4 weeks to a target dose of 3,000 mg/day for adults or a pediatric target dose of 60 mg/kg/day and treated at a stable dose of 3,000 mg/day (or 60 mg/kg/day for children) over 20 weeks (evaluation period). Study drug was givenin 2 equally divided doses per day. The primary measure of effectiveness was the percent reduction from baseline in weekly PGTC seizure frequency for levetiracetam and placebo treatment groups over the treatment period (titration + evaluation periods). The population included 164 patients (levetiracetam N=80, placebo N=84) with idiopathic generalized epilepsy (predominately juvenile myoclonic epilepsy, juvenile absence epilepsy, childhood absence epilepsy, or epilepsy with Grand Mal seizures on awakening) experiencing primary generalized tonic-clonic seizures. Each of these syndromes of idiopathic generalized epilepsy was well represented in this patient population. There was a statistically significant decrease from baseline in PGTC frequency in the levetiracetam-treated patients compared to the placebo-treatedpatients. The percentage of patients (y-axis) who achieved greater than or equal to 50% reduction in weekly seizure rates from baseline in PGTC seizure frequency over the entire randomized treatment period (titration + evaluation period) within the two treatment groups (x-axis) is presented in Figure 6. NDC 66689-028-50: Case contains 50 unit dose cups of 5 mL (NDC 66689-028-01), packaged in 5 trays of 10 unit dose cups each. NDC 66689-029-50: Case contains 50 unit dose cups of 10 mL (66689-029-01), packaged in 5 trays of 10 unit dose cups each. NDC 66689-030-50: Case contains 50 unit dose cups of 15 mL (66689-030-01), packaged in 5 trays of 10 unit dose cups. Store at 20°-25°C (68°-77°F); excursions permitted between 15° to 30°C (59° to 86°F) [see USP Controlled Room Temperature]. PHARMACIST: Dispense in tight, light-resistant container with a child-resistant closure. Advise patients that levetiracetam may cause changes in behavior (e.g. aggression, agitation, anger, anxiety, apathy, depression, hostility, and irritability) and psychotic symptoms [see Warnings and Precautions (5.1)]. Counsel patients, their caregivers, and/or families that antiepileptic drugs (AEDs), including levetiracetam, may increase the risk of suicidal thoughts and behavior and advise patients to be alert for the emergence or worsening of symptoms of depression; unusual changes in mood or behavior; or suicidal thoughts, behavior, or thoughts about self-harm. Advise patients, their caregivers, and/or families to immediately report behaviors of concern to a healthcare provider [see Warnings and Precautions (5.2)]. Inform patients that levetiracetam may cause dizziness and somnolence. Inform patients not to drive or operate machinery until they have gained sufficient experience on levetiracetam to gauge whether it adversely affects their ability to drive or operate machinery [see Warnings and Precautions (5.3)]. Advise patients to discontinue levetiracetam and seek medical care if they develop signs and symptoms of anaphylaxis or angioedema [see Warnings and Precautions (5.4)]. Advise patients that serious dermatological adverse reactions have occurred in patients treated with levetiracetam and instruct them to call their physician immediately if a rash develops [see Warnings and Precautions (5.5)]. Read this Medication Guide before you start taking levetiracetam oral solution and each time you get a refill. There may be new information. This information does not take the place of talking to your healthcare provider about your medical condition or treatment. What is the most important information I should know about levetiracetam oral solution? Like other antiepileptic drugs, levetiracetam oral solution may cause suicidal thoughts or actions in a very small number of people, about 1 in 500 people taking it. Do not stop levetiracetam oral solution without first talking to a healthcare provider. Stopping levetiracetam oral solution suddenly can cause serious problems. Stopping a seizure medicine suddenly can cause seizures that will not stop (status epilepticus). What is levetiracetam oral solution? primary generalized tonic-clonic seizures in people 6 years of age and older with certain types of generalized epilepsy. It is not known if levetiracetam oral solution is safe or effective in children under 1 month of age. Before taking your medicine, make sure you have received the correct medicine. Compare the name above with the name on your bottle and the appearance of your medicine with the description of levetiracetam oral solution provided below. Tell your pharmacist immediately if you think you have been given the wrong medicine. Levetiracetam oral solution is a clear, colorless, grape-flavored liquid. Who should not take levetiracetam oral solution? Do not take levetiracetam oral solution if you are allergic to levetiracetam. What should I tell my healthcare provider before starting levetiracetam oral solution? are pregnant or planning to become pregnant. It is not known if levetiracetam will harm your unborn baby. You and your healthcare provider will have to decide if you should take levetiracetam oral solution while you are pregnant. If you become pregnant while taking levetiracetam oral solution, talk to your healthcare provider about registering with the North American Antiepileptic Drug Pregnancy Registry. You can enroll in this registry by calling 1-888-233-2334. The purpose of this registry is to collect information about the safety of levetiracetam oral solution and other antiepileptic medicine during pregnancy. are breastfeeding. Levetiracetam can pass into your milk and may harm your baby. You and your healthcare provider should discuss whether you should take levetiracetam oral solution or breastfeed; you should not do both. Tell your healthcare provider about all the medicines you take, including prescription and nonprescription medicines, vitamins, and herbal supplements. Do not start a new medicine without first talking with your healthcare provider. How should I take levetiracetam oral solution? Take levetiracetam oral solution exactly as prescribed. Your healthcare provider will tell you how much levetiracetam oral solution to take and when to take it. Levetiracetam oral solution is usually taken twice a day. Take levetiracetam oral solution at the same times each day. Take levetiracetam oral solution with or without food. 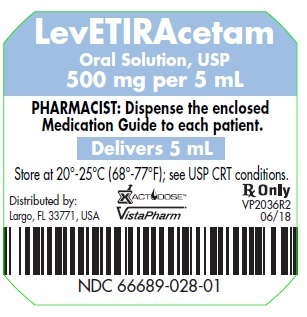 If your healthcare provider has prescribed levetiracetam oral solution, be sure to ask your pharmacist for a medicine dropper or medicine cup to help you measure the correct amount of levetiracetam oral solution. Do not use a household teaspoon. Ask your pharmacist for instructions on how to use the measuring device the right way. If you miss a dose of levetiracetam oral solution, take it as soon as you remember. If it is almost time for your next dose, just skip the missed dose. Take the next dose at your regular time. Do not take two doses at the same time. If you take too much levetiracetam oral solution, call your local Poison Control Center or go to the nearest emergency room right away. What should I avoid while taking levetiracetam oral solution? Do not drive, operate machinery or do other dangerous activities until you know how levetiracetam oral solution affects you. Levetiracetam oral solution may make you dizzy or sleepy. What are the possible side effects of levetiracetam oral solution? Levetiracetam oral solution can cause serious side effects. mood and behavior changes such as aggression, agitation, anger, anxiety, apathy, mood swings, depression, hostility, and irritability. A few people may get psychotic symptoms such as hallucinations (seeing or hearing things that are really not there), delusions (false or strange thoughts or beliefs) and unusual behavior. allergic reactions such as swelling of the face, lips, eyes, tongue, and throat, trouble swallowing or breathing, and hives. a skin rash. Serious skin rashes can happen after you start taking levetiracetam oral solution. There is no way to tell if a mild rash will become a serious reaction. These side effects can happen at any time but happen more often within the first 4 weeks of treatment except for infection. These are not all the possible side effects of levetiracetam oral solution. For more information, ask your healthcare provider or pharmacist. How should I store levetiracetam oral solution? 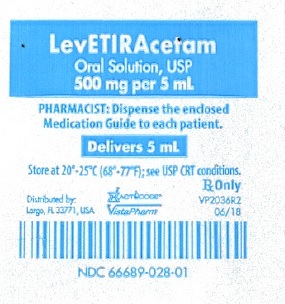 Store levetiracetam oral solution at room temperature, 59°F to 86°F (15°C to 30°C) away from heat and light. Keep levetiracetam oral solution and all medicines out of the reach of children. General information about levetiracetam oral solution. Medicines are sometimes prescribed for purposes other than those listed in a Medication Guide. Do not use levetiracetam oral solution for a condition for which it was not prescribed. Do not give levetiracetam oral solution to other people, even if they have the same symptoms that you have. It may harm them. This Medication Guide summarizes the most important information about levetiracetam oral solution. If you would like more information, talk with your healthcare provider. You can ask your pharmacist or healthcare provider for information about levetiracetam oral solution that is written for health professionals. You can also get information about levetiracetam oral solution by calling VistaPharm, Inc. at 1-888-655-1505. What are the ingredients of levetiracetam oral solution? Inactive ingredients: ammonium glycyrrhizate, citric acid monohydrate, glycerin, maltitol solution, methylparaben, potassium acesulfame, propylparaben, purified water, sodium citrate dihydrate and natural and artificial flavor. Levetiracetam oral solution does not contain lactose or gluten. Levetiracetam oral solution does contain carbohydrates. The liquid is dye-free. Store at 20° - 25°C (68° - 77°F); see USP CRT conditions.